I love simple and easy recipes for fresh produce, so when I came upon this recipe and method for refrigerator pickles I jumped on the pickle bandwagon. 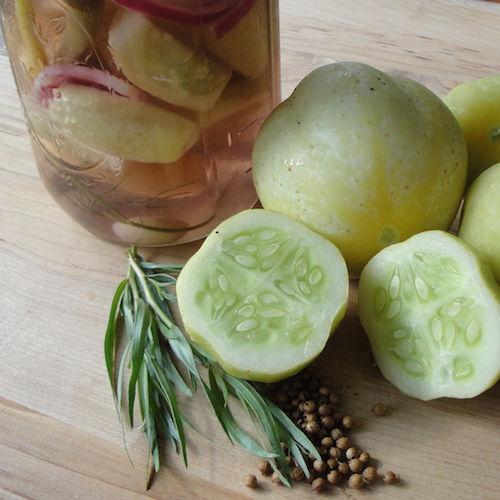 I’m new to pickling, but my lemon cucumbers are at their peak so I used them for my first pickle experiment. Refrigerator pickles are kept in the refrigerator since they are not processed and sterilized through a canning method. The vegetables used for these pickles are usually raw, but I found that using blanched green beans works really well and is a nice addition to the cucumbers. All it takes to make up a quick batch is to measure out the water and vinegar into a jar, add salt and sugar, add spices to your liking, then add the vegetables. Refrigerate for a couple of days and enjoy. Daphne, from Daphne’s Dandelions blog, says that the pickles will last a few months prepared this way. Another huge plus is that you can add vegetables to the jar as they ripen so you don’t have to fill the jar right away. Just prepare the pickle juice with the spices, refrigerate, and add vegetables as you have them available. That's my kind of easy! Cover the jar with a lid and refrigerate for a couple of days to allow the spices to flavor the vegetables. The spices I used in my version of her recipe resulted in tasty pickles but there is a lot of room for experimentation and trying a variety of spices and flavors. Use herbs and vegetables right out of your garden or have fun foraging at your farmer's market for produce to use. The green beans are especially good – I cooked them in boiling water for only a couple of minutes, drained them, then added them to the prepared jar. They were crisp, tender and delicious. A plate of fresh, chilled, pickled veggies makes a refreshing summer appetizer or is perfect for picnics, and as a garnish for salads. You'll most likely enjoy them as a snack right out of the jar - they're a perfect taste of summer. You don’t have to have a survivalist attitude to build a neighborhood foodshed, says Owen Dell. 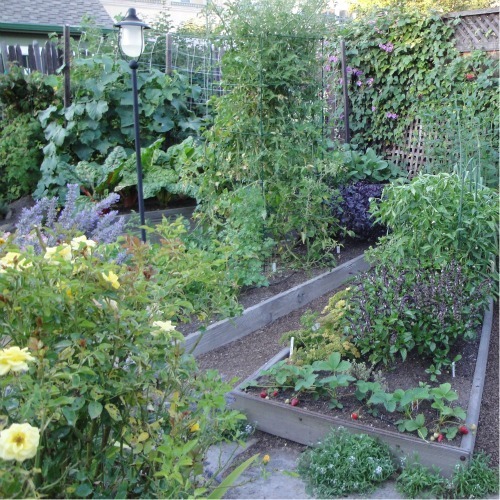 All it takes is coordinating and sharing the growing of food with your neighbors. Dell has a visionary idea about the future of food growing. He believes we can use suburbs to build sustainability in the sense that suburbs can harnessed as local food sources for neighborhoods. 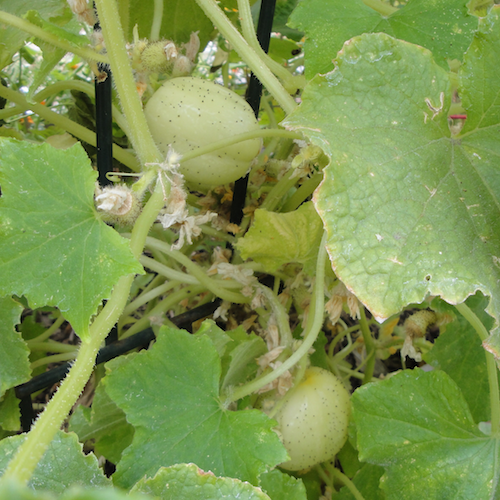 Growing food where it will be consumed and distributed means breaking free of dependence on fossil fuel for our produce. Suburban areas are a valuable resource: homes are surrounded by garden spaces and are often built on former agricultural lands. It doesn’t take a lot of space to grow an impressive amount of food, especially if you organize your neighborhood to cooperate in growing a diversity of vegetables, fruit, and keeping chickens for eggs. There are also social benefits to growing and sharing food. In a neighborhood foodshed there is shared knowledge, and shared responsibility - the result is building community and enabling healthy diets. According to Dell there is only a three-day supply of food in any given city: what happens on the fourth day when there is a natural disaster or some kind of disruption that stops the food supply chain? Most of us don’t realize how dependent we are on the unseen "food system" for our daily meals. He says that cities are like a CAFO (Concentrated Animal Feeding Operation, aka, a feed lot) for human beings: we are separated, dependent, and caged. Building relationships with our neighbors by sharing a fundamental activity such as growing food is a way to reconnect to the earth that feeds us, together as the human family. You can download his excellent flyer packed with background information on foodsheds and ideas for getting started here. 1. The foodshed area should be small enough to be walkable while carrying a load of produce. 2. It should be large enough to grow food for the participants. 3. Different crops are assigned to those willing to grow them and share. 4. Designate regular times for food swapping- perhaps a weekend produce market in someone’s driveway. 5. 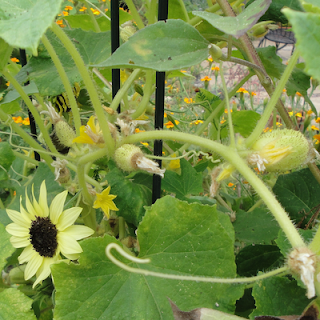 Share knowledge and provide ongoing assistance with gardening issues. 6. Those who cannot or don’t want to grow food may want to offer their gardens for others to use. Owen Dell is one of the engaging speakers that I heard at the EcoFarm conference last February. Dell is the author of Sustainable Landscaping for Dummies, (read a review here) and has a sustainable landscaping design business in Santa Barbara, Califonia. As we enjoy the long-awaited seasonal delights from our gardens, I was thinking that we could all use a little reminder to donate to our local food banks. There are good resources on the web that will help you find a food bank near you. 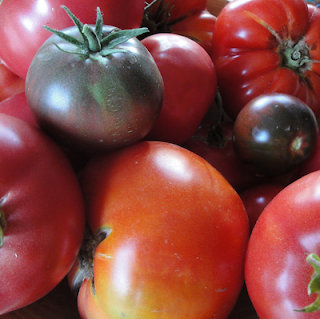 Ample Harvest is a great web site devoted to doing just that. 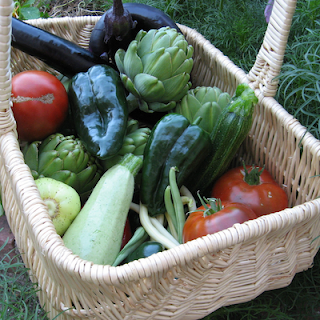 Sharing the bounty at harvest time comes naturally to gardeners - growing means giving. Sometimes we are sharing only with our families, but most often it's with our neighbors and community too. Planting a few extra vegetables to donate for those in need is a simple but powerful way for urban gardeners to contribute to the well-being of all members of our communities. 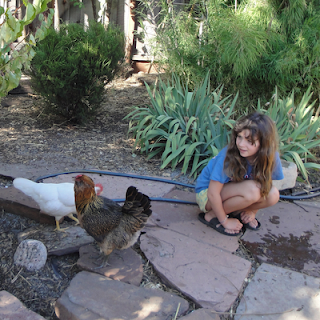 Growing food is a fundamental human activity that leads naturally to sharing our abundance with our neighbors. At my local food donation center, CommunityServices Agency (CSA) in Mountain View California, on average over 200 people a day shop at the agency’s Food and Nutrition Center for food to supplement what they and their families have to eat. The most popular items are fresh fruit and vegetables, and sadly there is often not enough of these to distribute. Donations of fresh herbs are also welcome and gardeners usually have an abundance of prolific herbs (oregano, thyme, mint, basil, etc.). Most gardeners are happy to contribute their surplus garden produce to feed the hungry, but the challenge is raising awareness about this simple but critical act. It truly makes an enormous difference to those who just can't afford fresh produce on a regular basis. So this summer get the most out of your luscious ripe tomatoes - think of those grateful and happy families benefiting from your generosity and thoughtfulness. Then remind your friends and neighbors to donate too!